As a young lad of 10 growing up in the mean streets of Thurmond in northwestern North Carolina, I attended Traphill Elementary School. Everyone at Traphill was a college basketball fan; it was a rite of passage — you either pulled for UNC, N.C. State or Wake Forest, which was located about 30 miles away. No one — and I mean *no one* — pulled for Duke at that time in my home of Wilkes County. Why would they? This was a year before Mike Krzyzewski arrived in Durham, so all those Blue Devils fans who’ve come out of the woods since then and jumped on the Coach K Bandwagon were all pulling for Dean Smith’s Tar Heels, Jim Valvano’s Wolfpack or some other program. While we were all dividing up our college basketball loyalties at Traphill, I had heard about a 7-foot, 4-inch dude named Ralph Sampson, who was then a freshman center at the University of Virginia. At that time, I couldn’t have found Charlottesville on a map even if you helped me. I never wanted to be like everyone else, though, so I became a Cavaliers fan because of Sampson. Also, my mom and dad had divorced a couple of years earlier; my brother Darrell (sadly, a UNC fan) and I lived with my dad. We had lost touch with our mom after the divorce, but she was from Virginia; I think somewhere deep in my subconscious, I was trying to connect with her, so pulling for the University of Virginia was perhaps a way to do that. For all those reasons, I became a Cavaliers fan. The first couple of years of being a Virginia fan were great — Sampson led the Wahoos to the NIT title his freshman season in 1980, then to the NCAA Final Four his sophomore season in 1981. There were a couple of hiccups his junior season in 1982 (including being upset by UAB in the Sweet 16), but Sampson came back his senior season — when everyone in the world told him to go on to the NBA — to win his elusive national championship. If you’re an N.C. State fan, you know what happens next: Valvano’s Cardiac Pack not only denied Sampson and Virginia an ACC championship in the tournament title game in Atlanta, the Wolfpack knocked out my hero and the Hoos in the NCAA Western Regional final a couple weeks later for a berth in the Final Four. That loss happened when I was in eighth grade at Traphill (a K-8 school). A year later, when I was a freshman at North Wilkes High School, Virginia inexplicably advanced to the Final Four without Sampson but was knocked out by the University of Houston. That happened in 1984. I was 15. Fast-forward to now — Virginia takes on Auburn tonight in its first Final Four appearance in 35 years. My Cavaliers fandom may have wavered a time or two — there were some mighty lean years with Jeff Jones, Dave Leitao and Pete Gillen as their coach — but I never gave up on the Wahoos, especially after a young hoops genius named Tony Bennett took over the reins of the program in 2009. I’ll admit, Bennett’s style of play (a “pack line” defense combined with a deliberate offense) isn’t the most exciting at times, but it has proven mostly effective. That is, it was mostly effective until the first round of the 2018 NCAA Tournament, when the No. 1 overall seeded Cavaliers took on a school I didn’t even know existed until the brackets were revealed — a program called UMBC (University of Maryland-Baltimore County). 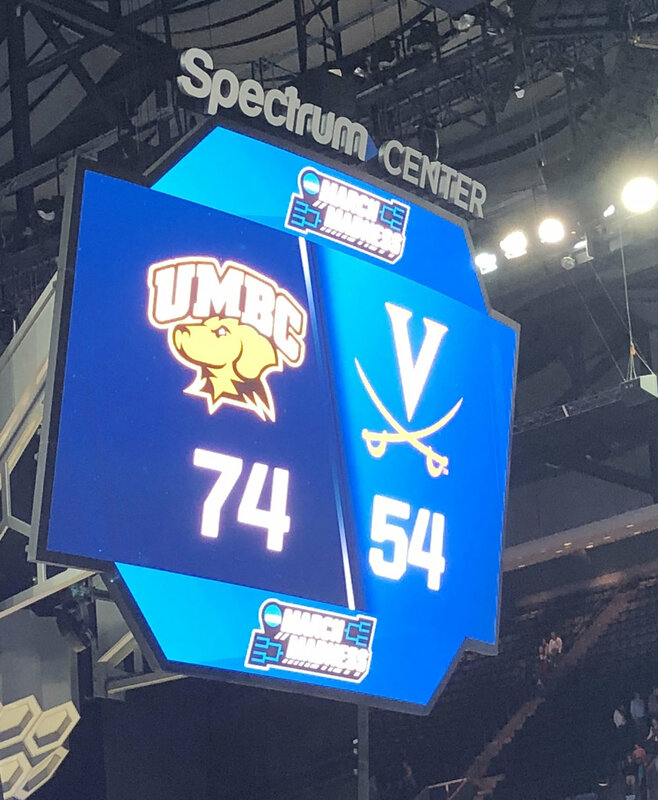 I was in attendance at Charlotte’s Spectrum Center that fateful evening of March 16, 2018, when the 16th-seeded Retrievers didn’t just upset my Cavahoos — they routed them to the tune of 74-54. Of all the pain I’ve gone through of being a Virginia fan (and a Washington Redskins fan too, but that’s a story for another day) for 40 years, that was almost the straw that broke the camel’s back. As I drove to my friends’ house in Charlotte that night where I was staying, I seriously considered the thought of burning all my Virginia memorabilia when I returned to Kinston. I mean, why not? I didn’t attend UVa., and — for the majority of the time I’d been a Virginia fan — all I’d ever experienced was pain. I slept on it, got up the next morning, drove back to Kinston and didn’t burn anything. And that’s what makes tonight so sweet for me. Win or lose against Auburn — or even in the championship game Monday night against Michigan State or Texas Tech if they’re lucky enough to make it there — this group of Cavaliers has accomplished something no other Virginia team has since 1984: advance to the Final Four. At 6 tonight, I plan to be sitting in my man cave, surrounded by friends (and some fellow Wahoo fans), my sweet puppy dawg and my autographed Ralph Sampson jersey while cheering for my team. I know a lot of you reading this are UNC, Duke or State fans; since your team isn’t in the Final Four this year, how about throwing some good vibes our way? Regardless, Wahoowa — and enjoy tonight’s games!